A Birthday is a very special occasion. As parents ourselves, we understand how important it is, AND how stressful it can be sometimes! That is why we have taken all of the hassle out of birthday planning. We take care of everything… except the cake! We leave the cake to you because like football this is a TEAM game! 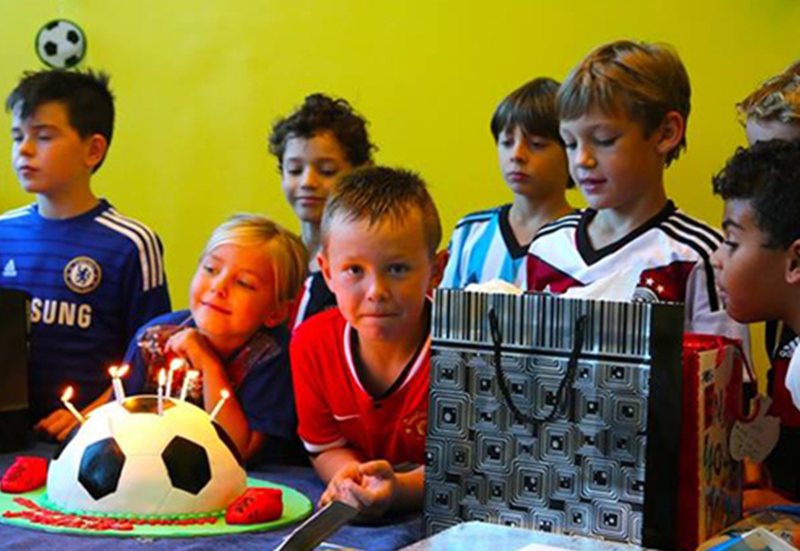 At All Star Sport we have a great Function Hall which we use for Birthday Parties, we take care of the decorations, balloons & bunting, to make sure that your kids have a great time! This area is generally where parents tend to congregate while the kids are having a blast on one of our amazing indoor football pitches (check out our instagram @allstardubai to find out more), and to encourage this we dedicate one member of staff to assist parents with complimentary tea, coffee & other soft drinks. Just let us know what you have in mind and we will move mountains to make it happen! If the children are below 7 years of age a coach that specializes in training under 7’s needs to be hired to ensure the best level of engagement with the children, this will be at an additional cost of 500 dhs. For children over the age of 7 years old, we provide in house coach that conducts all the drills and matches at no additional cost. One team member to assist in the birthday hall, and take care of both the adults and children players. Two hour access to our Football Field fully supervised by a coach. Two hour access to our party room area. All the decoration, including banners balloons etc. All the plates and cups and utensils. Birthday party cards and envelopes (this can also be provided via a digital copy). Goodie bags for all the children containing candy and a football item. Free coffee and tea for the parents. *The prices for the birthday parties are the same whether its on weekend or weekday. Does not include the cake. We even take care of the food & it’s NOT manufactured garbage, we care about our kids and yours; we only use hand-made gourmet quality ingredients which means even our Chicken Nuggets are made fresh by hand! Other menu items include: freshly made pizzas, French fries, healthy burgers & more. All soft drinks and water are completely complimentary in the catering package for parents convenience. Want to know more? Fill out the form below and let a friendly member of our team show you why, when it comes to Birthdays, we are the ALL STARS! Please note advanced deposits are required to secure bookings – please book early to avoid disappointment – we’re very busy with birthday bookers. Give us the details and we will get back to you with a quote!